You can make online purchases of MyEclipse products for teams and individuals using PayPal or a credit card. For all other products, you can request a product quote and our sales team will assist you with your purchase. 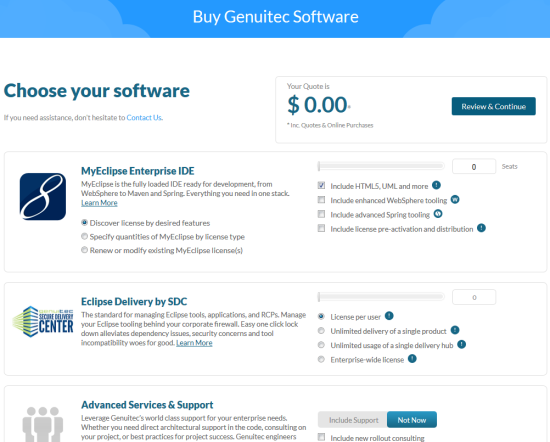 Go to https://www.genuitec.com/buy-now/ or select Shop from your profile and then click Buy Software Now. Tip: To view your order history, select Shop>History from your profile. Select the products you would like to purchase. After selecting the products to purchase, the total amount for your quote appears at the top of the screen. 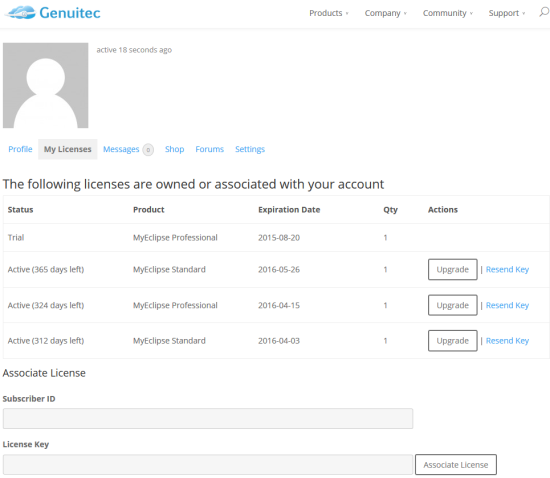 Discover license by desired features—Allows you to select the features you need (displayed to the right of this option) and let Genuitec add the appropriate product to your order. Specify quantities of MyEclipse by license type—Allows you to select the level of MyEclipse you need and the number of seats. Renew or modify existing MyEclipse license(s)—Directs you to your profile to renew or modify a license from the My Licenses tab. To purchase Eclipse Delivery by SDC, select the type of license you wish to purchase. If you select License per user, use the slider above that option to select the number of users. Tip: For a description of each option, place your mouse over the information icon . To include support for your product, click Include Support. Add to Cart—Click this button to purchase MyEclipse software only. All other products, including MyEclipse Secure and Eclipse Delivery by SDC, must be ordered from our sales team. Note: Your cart will display with all MyEclipse purchases. Click Update Cart if you make any changes on this screen. 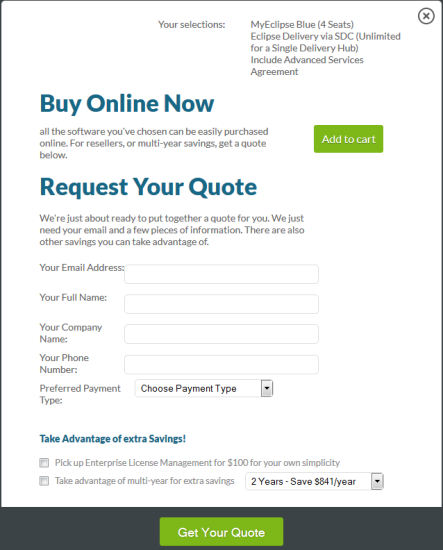 Get Your Quote—Complete the fields in the Request Your Quote area and click the Get Your Quote button if you want to receive an email quote with your selections. 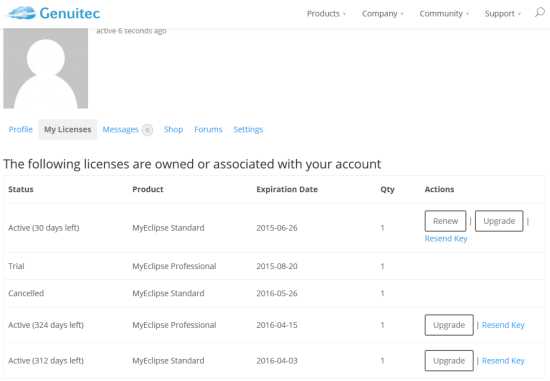 You can upgrade an existing MyEclipse license at any time to take advantage of additional features. Your license will keep the same expiration date and the upgrade price will be pro-rated for the time remaining on the current license. View your profile and select Licenses. A list of licenses displays. To upgrade to a new level of your product, click Upgrade. The available upgrade levels and pro-rated amounts display. Select the desired level to access your cart, proceed to checkout and place your order. You can renew your product subscriptions online once they are within 45 days of expiring. To renew a license, click Renew. The renewal appears in your cart. Note: This options is only visible when a license is expiring within 45 days.proceed to checkout and place your order. Proceed to checkout and place your order.